My eye and energy are beaming toward this July and August, when I shutter the Passage and take a break to receive friends here for summer holidays. Travellers pick up souvenirs, for sure, sometimes modest as a St-Ambroise beer coaster pocketed from a bar, occasionally a splurge; a couple recently fell in love with a painting! I'll show you several big hits with visitors, but you don't need to visit to enjoy them; they are also available online. All prices are in $CDN. An entire family of visiting Brits, (grandparents, Mum and Dad, two teenagers) fell hard for trèsnormale t-shirts-screen printed with original, deep-Montréal scenes. Left: the woman's model of Boulevard St-Laurent, part of the Urbanity series. Upper right: the artwork on the tee celebrating the 375th birthday of the city. 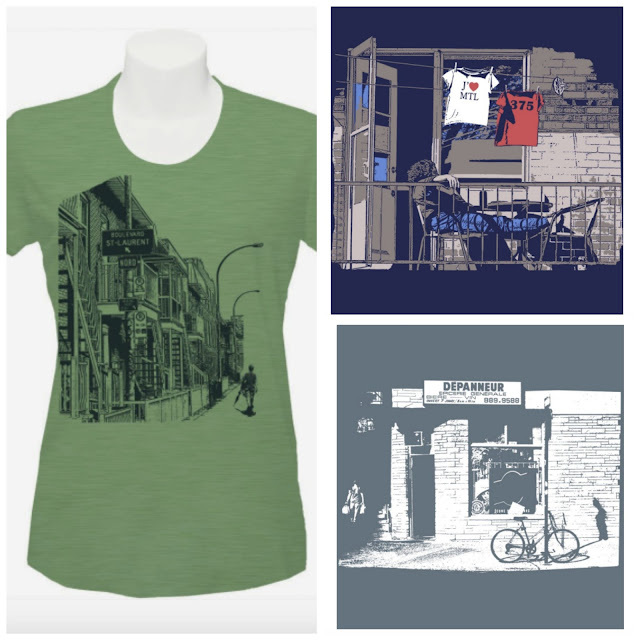 Bottom right, one of my favourites, the dépanneur (our French for 'convenience store'). Price, about $29. trèsnormale offer a wide range of sizes, including kid's. Some of the tees are in soft, 100% cotton, others are a cotton-bamboo-poly blend, and all are in muted, interesting colours. A number of designs are available as sturdy tote bags, $16 each. Bees to honey: Two sisters bought pieces for themselves, and one man bought a gift for his partner. The two operating in US dollars were thrilled by the exchange rate that makes Relaxed Real-level handcrafted items extremely affordable. Left: Mina splurged on one of Gabrielle Demarais' sculptural necklaces. Shown, the PK5 necklace, two silver discs on black cord—dramatic on its own and also layers well. Price, $95. (Her work is also available at Galerie Noel Guyomarc'h.) I adore Gabrille Demarais' jewellery, so I might have enabled her a tad, but is she happy! Upper right: Gene chose a pair of Lucie Veilleux Caviar stud earrings for his sweetheart, price, $59 on Lucie's Etsy shop. Lower right: This Ilk make fresh designs that feature vintage materials. Laurie bought herself the Cheeba necklace, $54, made with vintage ball-trimmed lace and green and black fringe. 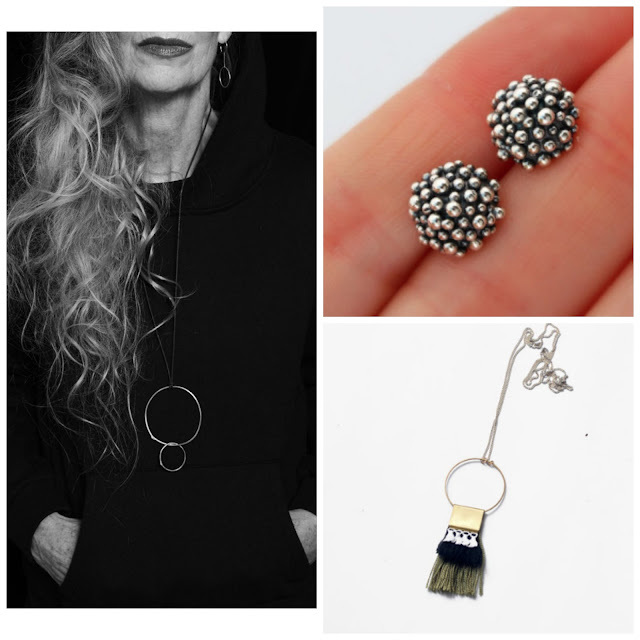 In Montréal you can find a selection from both artists at the wonderful boutique Articho. Montréal contains unique architecture that lends itself to arresting images; the best hint at their location rather than shout. Centre: Satin photoprint wallet of Habitat '67 (we're celebrating Expo 67's 50th anniversary), bound to please even the most design-conscious. Only $15 from fotofibre. 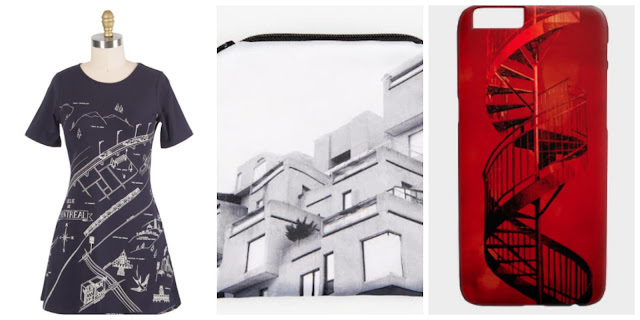 Right: Cherry red cellphone case with our iconic spiral staircase, for iPhone 6 or 6s from thelonelypixel; price, $49. Visitors+women=shoes; you're walking a lot and a new pair somehow makes sense. 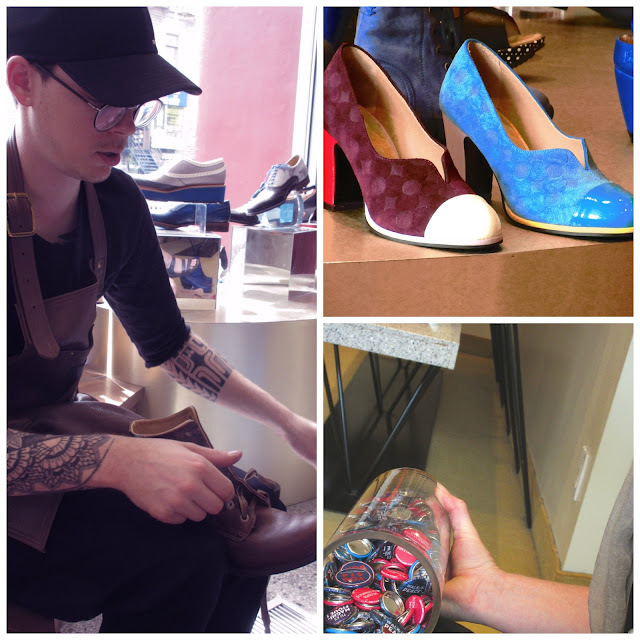 Fluevog is the edgy Canadian shoe brand, and though you can find it in other cities worldwide (and online), at the St-Denis boutique you would be served by the charming Maxime! Sarah found a pair of badass boots on sale, but we were also captivated by gorgeously-colored Iris suede pumps. Maxime encouraged us to take all the free buttons we'd like, printed with slogans like "Tu es magnifique", so Sarah scooped a handful for her friends back home. Having a wonderful time, wish you were here. Oh wait—it's not too late to plan a trip! Great suggestions. I usually come home with something - shoes, boots, jewellery but not last time. I'll have to visit Galerie Noel Guyomarc'h on my next visit. LauraH; May have been the rainy weather. Jane: He's not the first expat who's decided to stay. Though it is hard to have our children at a distance, at least it brings you here more often (I hope) and maybe, one time, we can meet. If you should happen to go there these days both boulevard St-Laurent and rue St-Dominique are blocked off because of roadwork, and the passage they left open for pedestrians was utterly inadequate for anyone with even minor mobility problems. It was basically a ditch. Not Articho's fault! I just returned from a first trip to Montreal (from the Gulf Coast) with my mother and three nieces. We had a wonderful time and were thrilled with your city. While there, I realized I wanted to come back here and thank you for the familiarity and affection I felt I already had with your city thanks to your blog. It made my experience richer and sweeter. Returning, I found this post in my reader, and immediately ordered a tee for myself and two for my mother. She wanted a Montreal tee and found only an unsatisfactory one in a souveneir shop. I'm not much of a souvenir tee person anyway. But those you featured evoked the Plateau (where we stayed) and other neighborhoods so well I couldn't pass them up. And I recognized one of the designs, because I found and purchased 2 as totes (one for me, one for Mom), as you mentioned, from a little shop on Boulevard St. Laurent just before it closed on my last evening there. I am in love with your belle ville and hope to return one day. RKG: Great story. I will guess you found the totes at Onze, who have several branches in the city. I especially like the Plateau tee. I am so happy that I could contribute to your trip here, and am not surprised that you loved Montréal. Come back! Duchesse, you nailed it. I could not have remembered under interrogation the name of the shop I wandered into. But now that you name it, I see the shop sign clearly. You're good.